Summary BYOD four-bay Intel D2700 Atom RAID SATA NAS with many serving options. Take a TS-569 Pro [reviewed], change the disk carriers for a slightly spiffier, but unlockable model, take out the display and drop the number of bays to four from five and you have the TS-469L. 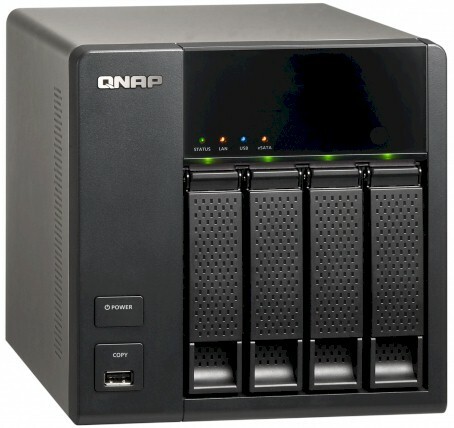 The 469L sits atop the four-bay group in QNAP's "Home and SOHO" NAS family. The low end of QNAP's NAS families have traditionally used less-expensive architectures based on Marvell storage SoC's. But QNAP seems enamored enough with the Cedarview family of Intel Atom CPUs to be using them...a lot. The focus for the 469L is lower cost, which QNAP achieves by sacrificing the disk tray locks and alpha-numeric display found in its "SMB" family products. I think the non-lockable trays give the Home and SOHO NASes a more updated look than the SMB family NASes with their lockable trays. While some might miss the ability to see the NAS IP address without firing up Fing or another network scanner, most home buyers would rather have the extra money in their pocket. The front and rear panel callouts below show that the essential indicators remain, as well as a full complement of USB 2.0 (5), USB 3.0 (2) and eSATA (2) ports. And even though you also now get an HDMI port to use with QNAP's "HD Station" features including XBMC, QNAP still includes a VGA port if you prefer your display old-school style. The too-smooth cover could use some indentations or other grippy features to make getting it off easier. But once off, the empty SoDIMM socket clearly awaits either a 1 GB or 2 GB DDR3 memory module, to bring the RAM complement to a total of 3 GB, fully blessed by QNAP. The TS-469L isn't designed for easy serviceability. Removing the fan requires removing the back cover and then nine screws before you can dismount the rear cover that holds the fan. Once you have the plate off, though, you can also easily get to the power supply. Removing the board is another thing entirely. That lower side lip shown above prevents you from completely disengaging the board's SATA backplance connector. There is probably some trick, but I couldn't see a way to get the board free without also removing the drive backplane. I was able to get the board free enough to identify most of the components, which are sumarized in Table 1 along with the TS-569 Pro's components. There is clearly a family resemblance. The Intel processor companion device must have enough SATA channels to handle the four drive bays plus the two eSATA connectors, because I didn't see any SATA multiplexers either on the main board or drive backplane. I'll note that the backplane was marked as "TS-469 Pro BP" and the main board was also marked as "TS-869 Pro V2" as shown in the photo above. I told QNAP that I would use four 3 TB WD Red drives (WD30EFRX) loaned by WD for testing. Power consumption measured 36 W with the 4 drives spun up and 23 W with them spun down. Fan and drive noise could be classified as very low, since the NAS was quiet as a mouse in my quiet home office.